Widely regarded as the pinnacle of budget smartphones, while some brands have added more specs and a lower price point, only Motorola has managed to produce a phone that works like one that is worth twice the price. The Motorola G5 Plus features a metal build this time around and measures 150.2 x 74 x 7.7mm and weighs 155g. The phone has a front-mounted fingerprint sensor built into the oval capacitive home button as well as a large circular camera housing on the rear, giving the phone a more premium feel. It also has a water-repellent coating. The G5 Plus features a graceful curve to the back and comes in Lunar Grey or Fine Gold, and will also be available in an O2-exclusive Sapphire Blue in the UK. The G5 Plus has a pixel density of 423ppi, making it sharper and crisper than predecessors thanks to the size reduction. The displays are also flat based and for protection, the G5 Plus is protected by Corning Gorilla Glass 3. As for cameras, the G5 Plus has a 12-megapixel sensor with Dual Autofocus Pixels, claimed by Motorola to be best in class, offering 25% more light thanks to its f/1.7 aperture, which is the same as the Samsung Galaxy S7 and S7 Edge. The phone also has the same 5-megapixel front camera as the Motorola G5. According to Motorola, the Dual Autofocus Pixels is designed to improve focusing time because there are ten times more pixels on the sensor. Running on the Android Nougat platform, the G5 Plus offers 32GB as standard, with microSD expansion available. The phone comes with a fingerprint scanner on the front, and a 3.5mm headphone socket Powered by 3000mAh battery that offers TurboPower charging. It’s compatible with Motorola’s Rapid Charger, offering six hours of battery life in 15 minutes. The G5 Plus also has NFC on board. In the UK, USwitch offers a wide range of deals on the Motorola G5 Plus from several different service providers. For example, you can own the G5 Plus for £39.99 down from EE with a 24-month contract. Monthly payments amount to £17.99 per month with 1 GB of data per month as well as unlimited calls and texts with a lifetime total to pay of £471.75. At the other end of the scale, Vodafone offers the Motorola G5 Plus for FREE but you pay £34 per month for a 24-month contract with 16GB of data, unlimited calls and unlimited texts. Total price to pay would be £816 in total. 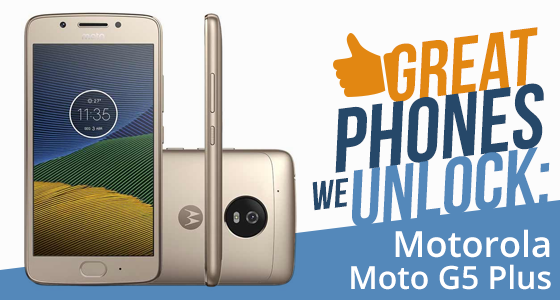 There are several other Motorola G5 Plus deals from other service providers, so you need to take the time to work out which best suits your needs. Can UnlockBase unlock the Motorola G5 Plus from EE UK or Vodafone UK (or any other networks)? Of course, we can! We offer the largest database of global service providers and smartphones on the web. The device requires a code to insert when it asks for “SIM Network Unlock PIN“. This can be done online fast and economically, you never need to be stuck with a contract you don’t like.